Issued for the Brotherhood of the Eternal Covenant / Monthly Message for Meditation / of Spiritual Significance / A Monthly Journal of Poetry, of Interpretation, Guidance, Watching, and Discipline. Philadelphia, PA, Oaklyn, NJ, Medford, MA; Lamott, PA. Publisher: Brotherhood of the Eternal Covenant. Editor: Kenneth Sylvan Guthrie. Corporate author: Brotherhood of the Eternal Covenant 1/1, February 1899-1907. 75 cents a year. 4 x 7, 4-32 pp. (varies: the original intention was to have every third issue a special one with 32 or more pages). Included a "Monthly message for meditation." In later years the color of the cover "corresponded with the "Astral Colour of the Sign" of the zodiac." This was the organ of the Brotherhood of the Eternal Covenant started by Rev. Kenneth Sylvan Guthrie, A.M., Ph.D., M.D., etc. (1871-1940). Guthrie was a sometime Episcopalian priest and classicist, and a Neo-Platonist and mystic. 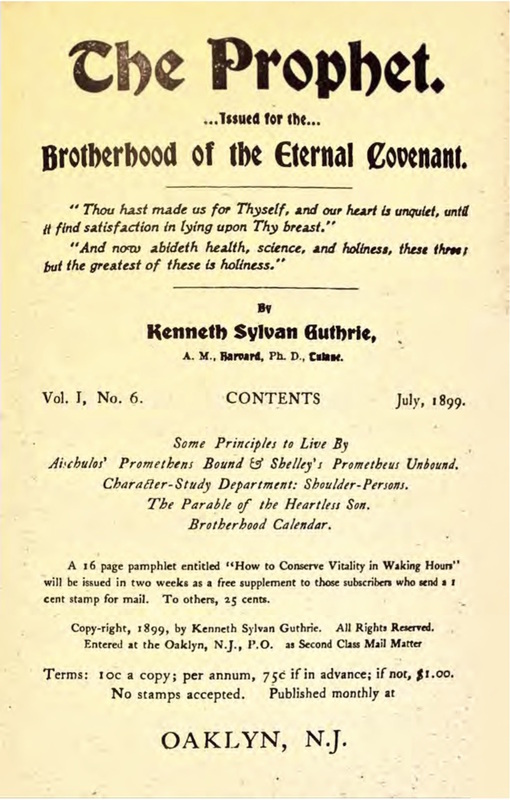 The purpose of the Brotherhood, as set out in the first issue, was "To present in a comprehensive, reasonable, unmistakable, specific way the only method to reach spiritual attainment." While Guthrie indeed had specific methods (a form of sexual continence, midnight vigils at times determined by astrology, and diet), they were scarcely set out in the journal, which limited itself to meeting notices of the Brotherhood and associated churches, astrologically guided advice to the reader, a Women's Department, idiosyncratic book reviews, and short articles of the uplifting sort to which occasionally some of Guthrie's classical and patristic studies were added. Guthrie figures peripherally in the story of the O.T.O. (Ordo Templi Orientis) because of his teachings on immortality obtained through sexual continence. Henri Birven (see Hain der Isis) believed that Guthrie was the initiator of Ernst Christian Heinrich Peithmann (1868-1943), a sexual-Gnostic who, it was said, later exchanged systems with Theodor Reuss, the founder of the O.T.O. See Helmut Moller and Ellic Howe, Merlin Peregrinus: Vom Untergrund des Abendlandes (Wurzberg: Konigshausen und Neumann), 180. Guthrie, however, was far too good a patristic scholar to see in the Gnostics other than heretics. The source of Guthrie's own sexual ideas was Hiram Erastus Butler, on whom see the notes under The Esoteric. Noted in "List of Advance Thought Publications," The New Cycle, March 1900, 159-60, and also in S.C. Gould's Notes and Queries, May 1900. About 1910 Guthrie for a time published the bi-monthly Good News For All to keep his followers abreast of "his latest achievements" and to provide them with inspiration. NYPL; LOC; Wisconsin Historical Society.